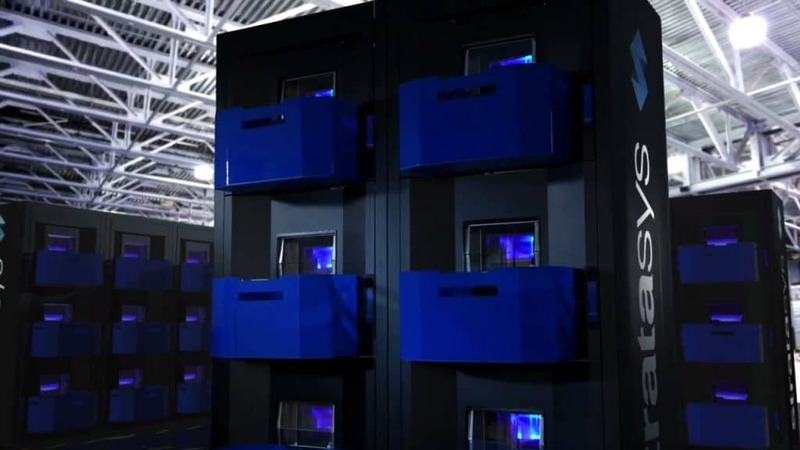 Stratasys are developing a brand new cloud-service platform; the continuous build 3D demonstrator designed to be expandable, server rack-like modular 3D printing units that are configured under one software program for simultaneous 3D printing production. The assembly line-style, cloud-controlled robotic 3D printers will be available at both Stratasys’ facilities and business partners, who will be able to utilise the new Continuous Build 3D Demonstrator system to produce parts in-house or allow customers to use it for their own manufacturing needs. Made up of individual 3D printer cells, the system has the capability to produce a different print job per cell, enabling mass customisation in volume production environments. As well as the flexibility to add more cells whenever required without limit. “Any customer can decide how they’d like to implement this” -Tim Bohling, Chief Marketing Officer at Stratasys. With the Continuous Build 3D Demonstrator system is still under development, partners including the Savannah College of Art and Design, and production parts manufacturers Fathom and In’Tech, are currently piloting the technology. Both In’Tech and Fathom offer 3D printed parts as a service already so the Continuous Build system will offer unparalleled levels of product customisation. A predominant issue facing Fathom’s manufacturing routine, Roger Kelesoglu- Director of NA Sales Enablement at Stratasys has outlined, is the growing amount of production runs, often exceeding 400 parts using additive manufacturing technology. The Continuous Build 3D Demonstrator will facilitate larger manufacturing runs of over 1,000 parts, and alleviate pressure of today’s demand for customisation. Each print cell has the capacity to print items up to 5 x 5 x 5 inches in size, while the smallest Continuous Build 3D Demonstrator comprises of just three 3D printers working simultaneously. “Certainly, the cloud-based software enables the connectivity between these units to present this virtual capacity and specificity to where jobs are requested,” Bohling explained. When the customer’s manufacturing request is sent to the expandable array of machines, its first stop is the cloud service not the machine, whether in-house or distributed across a number of sites. The system offers 99% availability to cloud customers. “Our development customers today have Continuous Build 3D Demonstrators onsite. At the university, students may submit part requests online to be printed and pick up completed 3D prints,” Kelesoglu said. Utilising Stratasys’ production-class Fortus FDM 3D printing technology, the Continuous Build 3D Demonstrator builds parts through extrusion of thermoplastic filament layer by layer, gradually building a 3D object. “With the proven print engine technology that powers our current Fortus line of 3D printers, we can ensure we’re delivering a part quality that can be used today in manufacturing applications,” Bohling continued. When individual jobs are complete the parts eject into bins placed beneath the cells and then the next print job in the queue begins automatically. If a single print fails, the job is automatically rerouted to the next available cell. Using innovative GrabCAD 3D printing software, job requested are simplified in the form of CAD-generated .stl files that are submitted to the cloud for printing. The 3D Demonstrator has been designed to target applications for service bureaus, rapid prototyping centres, and volume manufacturing environments- especially those that can benefit from part production without the need for tooling and from zero-inventory supply chains. “With this announcement, Stratasys is beginning to close the gap between additive and conventional manufacturing, combining the benefits of both to bring new value to our customers,” He concluded.